Besides running I like bicycling, hiking and being outdoors to take in all of the sights and sounds of nature. I like to run with anyone on the same schedule, but that is difficult, so I usually train solo. Having friends to run with is what makes the marathons so special. To stay healthy and keep running and helping others achieve their running goals for many more years. I run to relieve the stress of everyday life and to feel good mentally and physically. My best marathon memory is The Sunburst Marathon 2008 because it was the first marathon that I ran a steady pace and qualified for Boston. It was also my first marathon with no pain afterwards. I like pacing because it allows me to help others achieve their goals, make new friends, share running experiences and just have fun while running. Pacing also helps keep me in shape to race my goal marathons. My best pacing experience was at the Snicker’s Marathon 2009 when I helped a couple of female runners qualify for Boston for their first time. 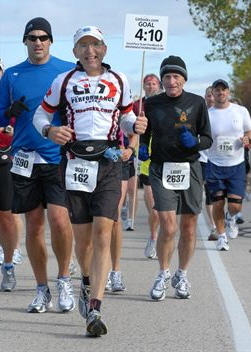 You should run in my pace group to have fun while achieving your goal while being encouraged by the group experience. We will run at a steady pace on the flats and balance the hills so as to stay on pace. You should try to run relaxed, think positive and just enjoy the run. Also communicate with me if you have and questions or concerns and I will do my best to help you. 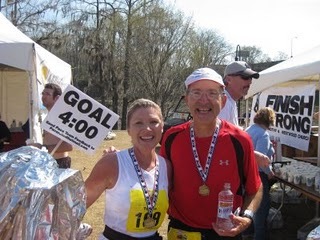 Marathon vacations are a great way to see the country and make many great new friends.